1940s vintage exhibition print of Cecil Beaton photograph D 4750. The Royal Air Force: A bomber crew is debriefed after their return from a night raid. Black and white silver gelatine photograph. Handwritten annotations on verso in pencil, red pencil crayon and black ink. Also has a black rubber stamp on verso. 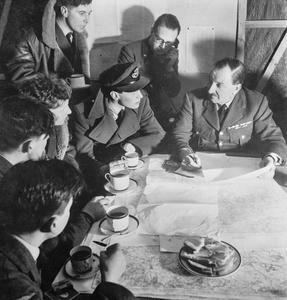 Cecil Beaton photograph of an RAF bomber crew being debriefed by the squadron intellgence officer on their return from a night raid over Germany, 1941.